Mexico X-Fighters Opens 2015 Season Competition. As heating for the opening of the Red Bull X-Fighters 2015 in Mexico City, the pilots Mat Rebeaud, Switzerland, Australian Harry Bink and Brody Wilson, the United States, made a presentation with radical maneuvers of Freestyle Motocross (style free) in Mexico City. The show jumping and motorcycle stunts happened next to the traditional "palo volador", near Mexico City. The spectacular ceremony of "Danza de los Voladores" consists of four people suspended in the air spinning upside down on a pole 30 feet high. His feet are tied to the pole and the ropes go down to the floor. While dancing, like the famous Pyramid of the Sun, symbolizes the rich heritage of the country, the Red Bull X-Fighters incorporates all of modern Mexico. 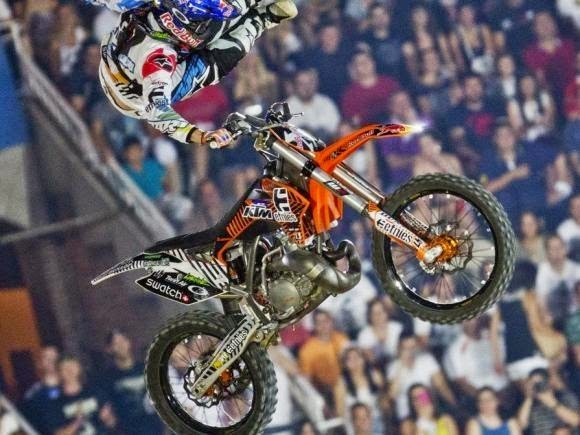 The pilots of the Red Bull X-Fighters World Tour 2015 will take its maneuvers to the limit in Mexico City, in the monumental Plaza de Toros, where the leap up to 30 feet away from 15 high. The world's best FMX athletes - including former champions Tom Pagès, France (2013), Levi Sherwood of New Zealand (2012), Spaniard Dani Torres (2011) and Mat Rebeaud (2008) - show new and breathtaking maneuvers improved during the winter in the season opener. The Red Bull Mexico City X-Fighters will be broadcast live on redbullxfighters.com site by Red Bull TV from midnight GMT (DF), on Friday facing Saturday (7/03 ). Red Bull TV is available on TVs connected to the Internet, consoles, smartphones and other devices. The SporTV pay TV channel also announced in its program the live broadcast of the competition from 0h30.